When saving for one’s retirement, every little bit helps. Sometimes retirement plan providers plant their fees inside the 401k plans they are creating, which can come as a costly surprise to consumers. Not to mention, it means consumers earns less on their investment than expected. 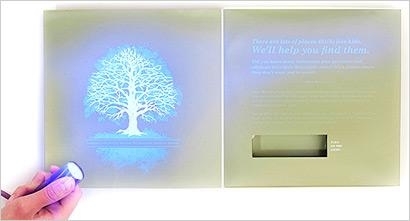 West Coast-based First Western Trust decided to expose this hidden business with a direct-mail piece that uses a black light to unearth fees written in invisible ink. The secret was unleashed this summer when First Western Trust sent 250 direct mail pieces to small businesses who offer company 401k plans through a competing firm. The mailer also invites recipients to contact an associate at First Western for a free benchmarking review, valued at $1,500. The goal of the campaign was to “introduce First Western Trust’s Retirement Services as a way for company owners to make significant savings in the fees on their 401K plans so that the Retirement Services team can schedule 401K Benchmark Reviews and ultimately win new clients,” said a company spokesperson. 1 comment about "Direct-Mail Campaign Shines Light On Hidden Bank Fees". Bill Burnett from Good Citizen Media Group, October 28, 2013 at 5:12 p.m.
Nice idea. Smart. Takes a big budget. Amy Corr is managing editor, online newsletters for MediaPost. She can be reached at amyc@mediapost.com.